The holidays are a tricky time for e-mail security. It?s the time of year when everyone is so busy getting ready for the holidays that little things can get through your security wall much easier. You are busy at work finishing projects and getting ready for the break while ordering gifts from internet sites and getting lots of discount offers and codes for free shipping. Some of your favorite sites are bound to have quite a few offers that you just can?t refuse and so you will click through to see that special offer you have been waiting for. The problem is that while this is the time of year for great holiday specials it is also the time of year when phishing is at its most virulent. People are waiting for packages to ship and watching for their e-mail from UPS, FedEx or the good old Postal Service and that is when phishing is the most dangerous. Phishing is the practice where an entity tries to trick a computer user into sending them usernames, passwords or bank account numbers that it can then be sold to other entities who will use the stolen identity to get credit cards, empty out bank accounts, or other bad things. During the holidays phishing is often done using a false e-mail from an entity pretending to be UPS, FedEx or the US Postal Service. If you respond to these e-mails they ask for certain aspects of your on-line identity which they steal and sell. Everyone knows not to send their information to banks so those phishing expeditions are much less effective with a technically savvy person, but people can still be fooled by a phishing scam that is seen to come from a package delivery company at this time of year. It is the sheer volume of orders that people are making from catalogs and internet sites and each of those orders come with legitimate shipping information and shipping updates. It is easy for a phishing scam to slip by. No one is perfect and that is one of the reasons that MxToolBox offers the highest quality perimeter protection available. MxToolBox will make sure that the phishing never gets to your inbox, which is a huge relief. When you can be certain that the e-mail you receive is legitimate you can rest easy around the holidays. MxToolBox also provides relief for your email system by freeing up bandwidth. When your server has to process all that junk e-mail you lose bandwidth for other functions and it can get bogged down. MxToolBox?s perimeter protection frees your server from even needing to process the junk. Perimeter protection is not offered by all e-mail providers, but it is guaranteed with MxToolBox and our high-quality email service. Your filtered connection through MxToolBox will guarantee that you don?t fall victim to those out there trying to steal pieces of your identity to sell. With MxToolBox you can rest assured through your winter buying sprees that your computer is safe and snug on these winter nights. This entry was posted in MX News on November 25, 2008 by MxToolbox Blog. (11-24) 16:58 PST — Facebook has won an $873 million judgment – the largest to be delivered under federal anti-spam laws – against a Canadian resident accused of sending more than 4 million bogus messages from members’ profiles, many advertising male enhancement drugs. The man, Adam Guerbuez, did not defend himself or show up in court. The order was signed Friday in San Jose by U.S. District Judge Jeremy Fogel. O’Rourke declined to say how the social networking site linked its spam to Guerbuez, but said this is not the last lawsuit Facebook will file. It also is investigating spam messages offering fake Macy’s gift cards that showed up in members’ profiles in October. “We are very much intent on policing the site and making sure Facebook is not seen as a place for spammers to target,” O’Rourke said. Facebook sued Guerbuez and his business, Atlantis Blue Capital, which Facebook alleges is fictitious, in August, and accused him of sending more than 4 million spam messages in March and April. According to Facebook’s complaint, Guerbuez acquired logins and passwords of Facebook members, in some cases by luring them to phishing sites where they would unwittingly enter personal information, then used infected computers to automatically log into their Facebook profiles and pump out spam. The messages advertised Web sites owned by Guerbuez and others that offered male enhancement drugs, among other products. “There’s a potential reputational harm (to Facebook) when users get annoyed or angry or embarrassed,” O’Rourke said. 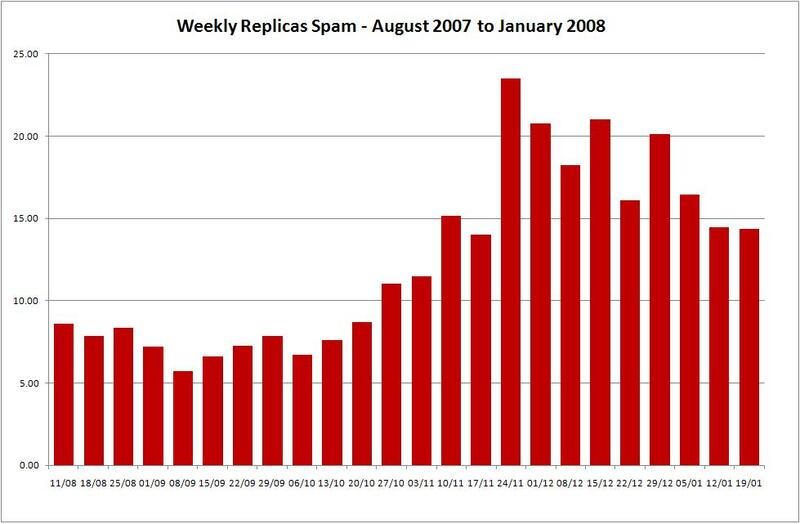 Social networks are rich targets for spammers because members believe they’re getting messages from friends and are more likely to at least look at the spam, said Adam O’Donnell, the director of emerging technology at Cloudmark in San Francisco, which sells spam blocking software to several social networks. Members of social networks aren’t seeing as much spam as they were six months ago, he said. But he also expects spammers to move their activities overseas as U.S. law enforcement turns up the pressure on spammers who live in North America and are easier to reach. This entry was posted in MxWatch on November 25, 2008 by MxToolbox Blog.